With June comes the desire for outside. Outside for walks and hikes. Outside for dining on the patio. Outside soaking up that much-needed vitamin D.
This time of year, outside also means music. 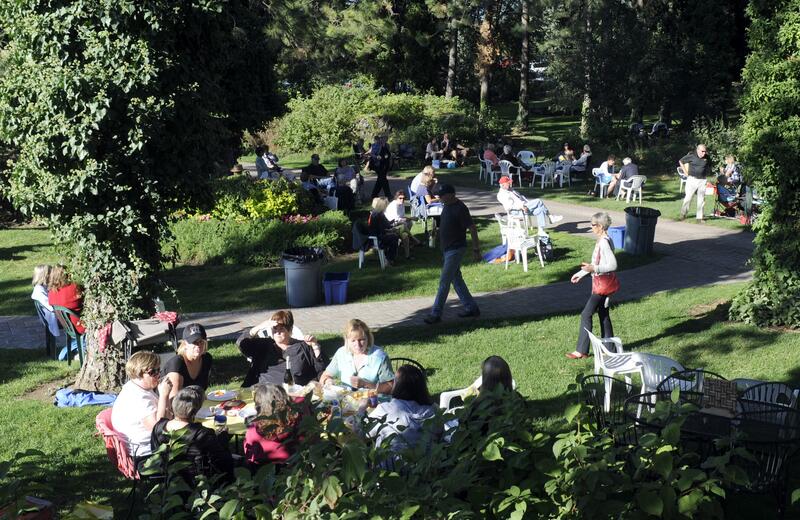 The Park Bench Cafe at Manito Park kicks off its outdoor music season tonight. The folks at Arbor Crest have been at it for a few weeks now with their twice-weekly outdoor shows. The Hotel RL recently announced its lineup of shows, and things are brewing with the Live After 5 series in Coeur d’Alene. Here, we’ll round up some of those popular spots to catch music in the great outdoors for little to no money. And if we forgot something, please send the details to carolynl@spokesman.com. Park Bench Cafe: The season kicks off Friday night with three performers, Flight Risk at 6 p.m., Michael Keleren at 6:45 and Daniel Hall at 7:30 p.m. The series continues on Friday evenings through Aug. 17 and will feature acts such as the Trailer Park Girls, Wyatt Wood, the Brad Keeler Trio and Just Plain Darin. Fridays, 6-8 p.m., 1976 S. Tekoa St., in Manito Park. (509) 456-4349. Free. Arbor Crest: The winery, located on a bluff above the Spokane Valley, offers music two days a week. Cattywomp is on the bill Sunday with the Jim Harrison Trio set to perform Thursday. It’s a winery, so admission is ages 21 and older only. Sunday and Thursdays, 5:30 to 8 p.m., 4705 N. Fruit Hill Drive, Spokane Valley, (509) 927-9463. $5 Thursdays, $10 Sundays. The Hotel RL Rhythm and Brews Concert Series: The hotel sponsors a concert series on its back patio, right along the Spokane River. The Friday and Saturday night concerts kick off June 15 with Max Daniels and Nu Jack City and June 16 with Spare Parts. The series runs through Aug. 25 and will include Sammy Eubanks, Too Slim and the Taildraggers, Abbey and Friends, Sara Brown and Paperback Writer. 6-9 p.m. Fridays and Saturdays, 303 W. North River Drive, (509) 326-8000. Free. Browne’s Addition Summer Concerts: Thursdays in July and August, music fans can head to Coeur d’Alene Park in Browne’s Addition for an evening of music. The series begins July 5 with the Willows, a Peter, Paul and Mary tribute group. Coming up this season are Tango Volcado, Maxie Ray Mills and Flight Risk. 6-8 p.m. Thursdays, 2195 W. Second Ave. Free, donations accepted. Cheney Summer of Fun: Beginning July 11 and through Aug. 22, the city of Cheney will hold weekly concerts on Wednesdays at Sutton Park. The 3D Band will get things going, with Mojo Box, Costa La Vista, Lyle Morse, Jan Harrison Band, Scattergun and Last Chance for Gas rounding things out. There are movies, too, on Friday nights. Visit www.cityofcheney.org and click on Parks & Recreation for details. 6:30-8 p.m. Wednesdays, 815 Washington St., Cheney, (509) 498-9250. Free. Live After 5: This Wednesday night series is held in McEuen Park and kicks off at 5 p.m. July 20 with the Kelly Hughes Band. The fun continues through Sept. 5 with the Rub, with visits from Sol Seed, Five Alarm Funk and others in between. Ticketing information is not yet available, but last year’s shows cost $5. For details, visit http://liveafter5events.com. Concerts in City Park: The bandshell in Coeur d’Alene’s City Park will host concerts from 1-4 p.m. Sundays in July and August. 415 Fort Ground Drive. Free. Hayden City Concert Series: Thursdays from 6-8:30 p.m., head to McIntire Family Park. There, from June 28 through Aug. 16, enjoy music by the CdA Big Band, the Rhythm Dogs, Stagecoach West and others. They’ll take July 26 off for Hayden Days. 8930 N. Government Way, (208) 209-1080. Free. Riverstone Summer Concert Series: Also on Thursdays, the park at Riverstone in Coeur d’Alene hosts music, beginning July 5 and running through Aug. 3. Concerts are 6-8 p.m. and will feature performers from Coeur d’Alene Summer Theatre, the Coeur d’Alene Symphony, Nu Jack City and Chicken Dinner Road. 1805 Tilford Lane, (208) 292-1629. Free. Published: May 31, 2018, 4:24 p.m.